Most geography-savvy people in the planet, as well as ancient mythology buffs, know that Mt. 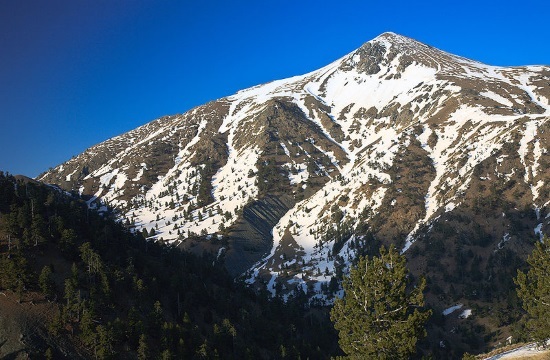 Olympus is the highest peak in Greece, but how many - including Greeks - know which mountain is the second highest in the east Mediterranean nation? At 2,637 meters in elevation Mt. Smolikas takes second-place billing to famed Olympus. Situated in northwest Ioannina prefecture and on the western border of Grevena prefecture, Smolikas is the highest peak in the Pindus range, and similar to Olympus, is a more-or-less straightforward climb for experienced climbers and hikers. The mountain is also noteworthy for the existence of a small alpine lake, named "Drakolimni Smolika" (Dragon lake Smolika) near the summit, at roughly 2,200 meters in elevation. The frigid lake is filled with alpine newt (Ichthyosaura alpestris), who seem oblivious to the presence of humans.